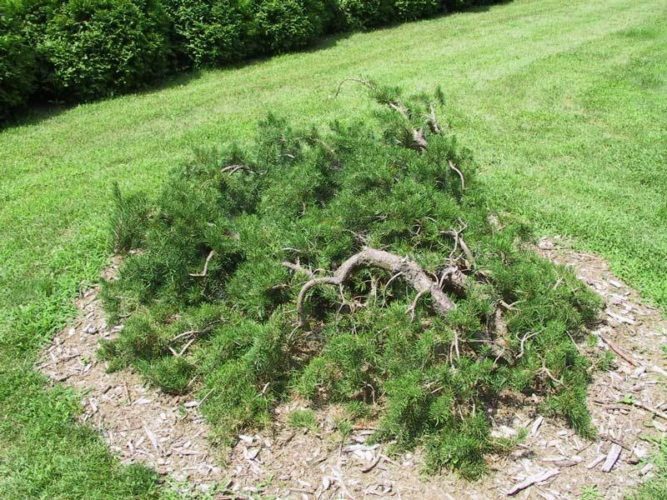 Pinus banksiana 'Uncle Fogy' is a pendulous form of Jack pine with wildly undulating, pendulous branches. The winter buds are densely covered with resin. According to Iseli nursery, it is a "bizarrely attractive collector's plant." Typical rate of growth for this cultivar is 12 to 18 inches (30 - 45 cm) per year, obviously producing a very large specimen in very short order. It tends to grow upward for only a few feet (1 m) before knuckling over and hugging the ground. However, 'Uncle Fogy' is very forgiving of staking and aggressive pruning which helps to contain it and can allow for very artistic presentation. 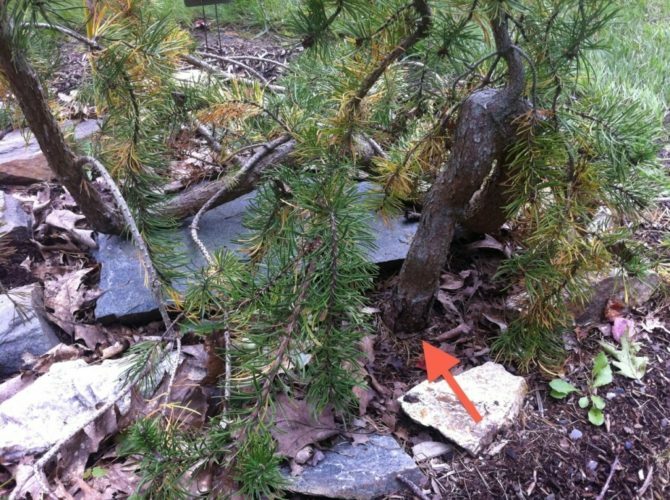 According to Ken Church, "As can be seen from the picture of the plant at the Dawes Arboretum in Ohio, this plant can remain low to the ground. I have seen other examples where it is staked upward. Its twisted growth reminds one of a traditional Irish walking stick, the shillelagh. Extremely cold hardy." The legend is that the name, 'Uncle Fogy' is believed to have come from the excessive resin that oozes from the new buds and, presumably, reminding the viewer of a toothless old man who drooled!!! More likely it was a reference to a character that Clarence Tolg, a staff announcer at WCCO radio in Minneapolis, developed for a gardening program he did in the 1950s and 60s. This cultivar originated as a wild-collected seedling found in the 1960s by A.G. Johnson and later planted in the home garden of Mrs. Wylder of Richfield, Minnesota. Pinus banksiana 'Uncle Fogy' This picture was taken of a plant that I would estimate to be possibly 20 years old. It is located at the Dawes Arboretum in Ohio. 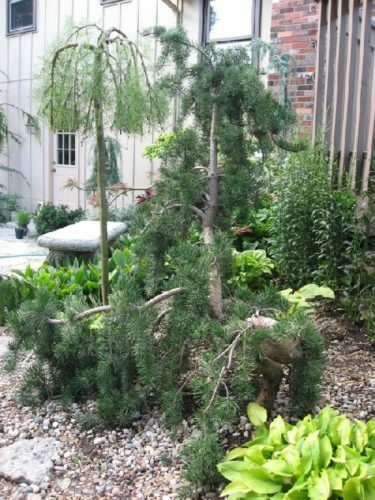 The picture was taken in 2004 during the Conifer Society tour there in 2004. 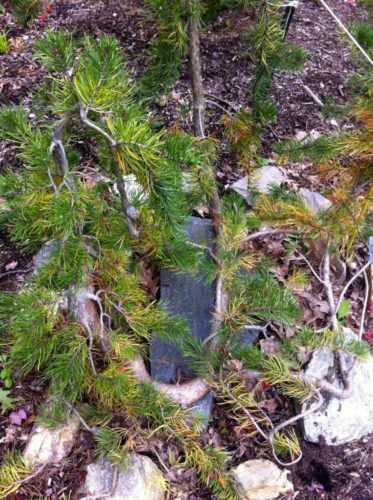 Pinus banksiana 'Uncle Fogy' 2007 donation. 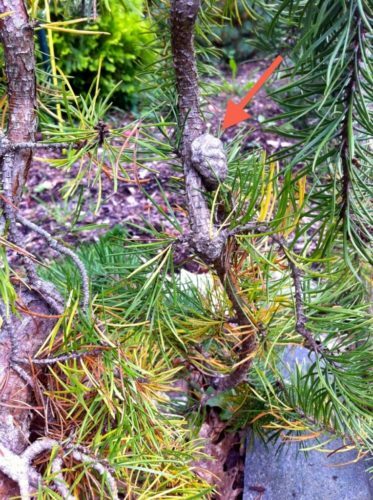 Note where the trunk emerges from the ground (arrow) and then dives down and winds around to the left before shooting up on this 'Uncle Fogy' photographed in fall, 2013, in Brunswick, ME. Another view of this winding Uncle Fogy Jack pine photographed in fall, 2013, in Brunswick, ME. Old cone of 'Uncle Fogy'. The cones fit snugly around the stem and stay for some time until freed by fire or knocked to the ground. Some will hold on and gradually be engulfed by the growing wood.